The luxury liner Costa Concordia, which sank in January 2012, has left its sea bed and is now preparing to make its last voyage. The vessel will travel to Genoa, where it will be cut for scrap metal. A night storm on the island of Giglio did not impact the raising of the wreck, which was kept under the watchful eye of the media. The operation to refloat the giant 290 meter ship began at 6 a.m. Monday morning. 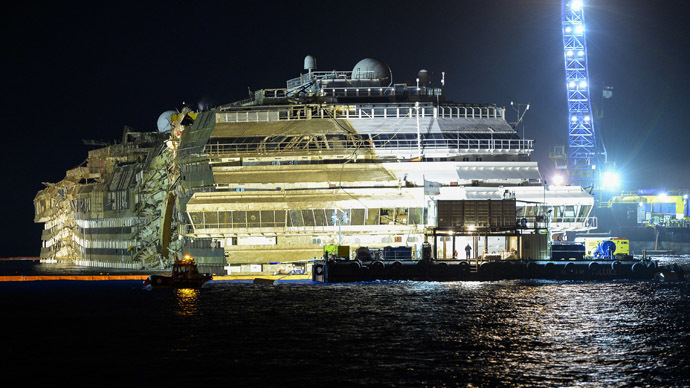 Within a few hours, the Costa Concordia was raised about 2 meters and moved 30 meters to the east. The salvage operation was aided by air pumped into 30 large sponsons attached around the hull of the 114,500 ton ship. The lifting of the damaged vessel puts it on course for its journey towards the open sea. “The wreck of the Costa Concordia has been raised at both bow and stern of the platform on which it rested, thanks to the wreck floating caissons. Two tugboats pulled it toward the east, toward the sea. 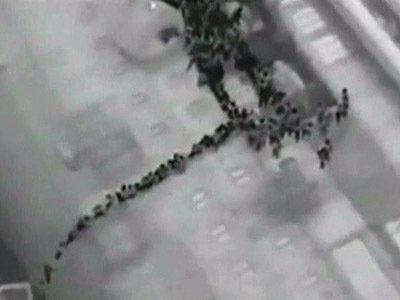 Operation proceeded in the time and manner established,” project manager Franco Porcellacchia said, adding that the removal has an estimated cost of $1.5 billion. 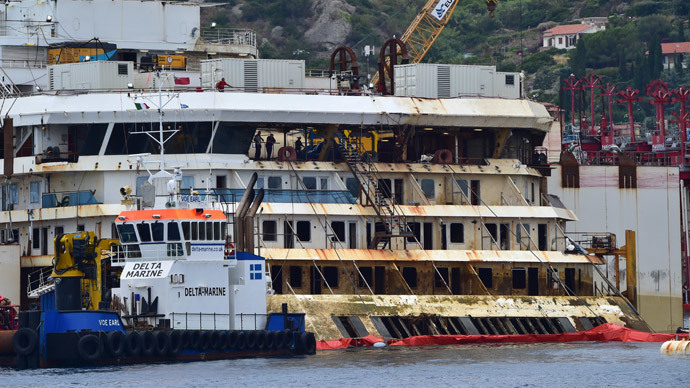 “The operation began well, but it will be completed only when we have finished the transport to Genoa,” Italian Environment Minister Gian Luca Galletti told reporters on Monday. Preparations for the towing of the ship are expected to last until July 21, when the wreck is due to depart Giglio. It is about 200 nautical miles to Genoa, and the trip is expected to take five days. The cruise liner will be scrapped in Genoa by oil services company Saipem and Genoa-based companies Mariotti and San Giorgio. 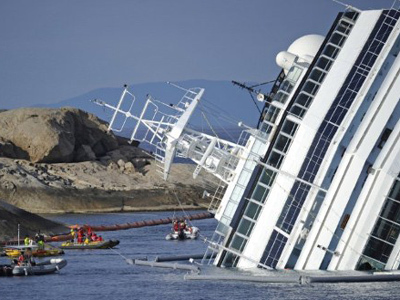 On January 13 2012, Concordia capsized after striking a rock in the Tyrrhenian Sea, near Isola del Giglio. 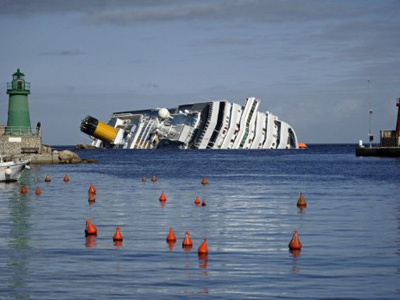 The vessel was under the command of Captain Francesco Schettino. The 50 meter gash on the port side of her hull caused the ship to sink. An order to abandon ship was not issued until over an hour after the initial impact. 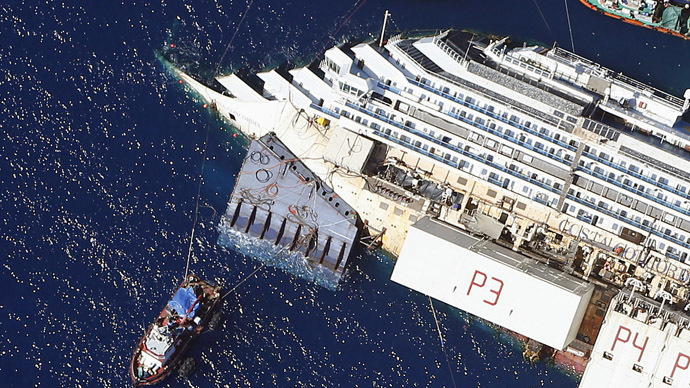 The evacuation of the Costa Concordia took over six hours, and not all passengers were evacuated. Of the 3,229 passengers and 1,023 crew known to have been aboard, 32 died. Concordia's Italian captain is now being tried for manslaughter, causing the shipwreck, and abandoning ship before all were evacuated.